Pic Credit: Mckinsey & Co. In a mere two decades, China has become Africa’s biggest economic partner. Across trade, investment, infrastructure financing, and aid, there is no other country with such depth and breadth of engagement in Africa. The Chinese “dragons”—firms of all sizes and sectors—are bringing capital investment, management know-how, and entrepreneurial energy to every corner of the continent—and in so doing, they are helping to accelerate the progress of Africa’s “lions,” as its economies are often referred to. Yet to date, it has been challenging to understand the full extent of the Africa-China economic relationship due to a paucity of data. This report aims to provide a fact-based picture of the Africa-China economic relationship. Its foundation is a large-scale data set about the economic relationship between Africa and China, including on-site interviews with more than 100 senior African business and government leaders, as well as the owners or managers of more than 1,000 Chinese firms and factories spread across eight African countries that together make up approximately two-thirds of SubSaharan Africa’s gross domestic product (GDP). 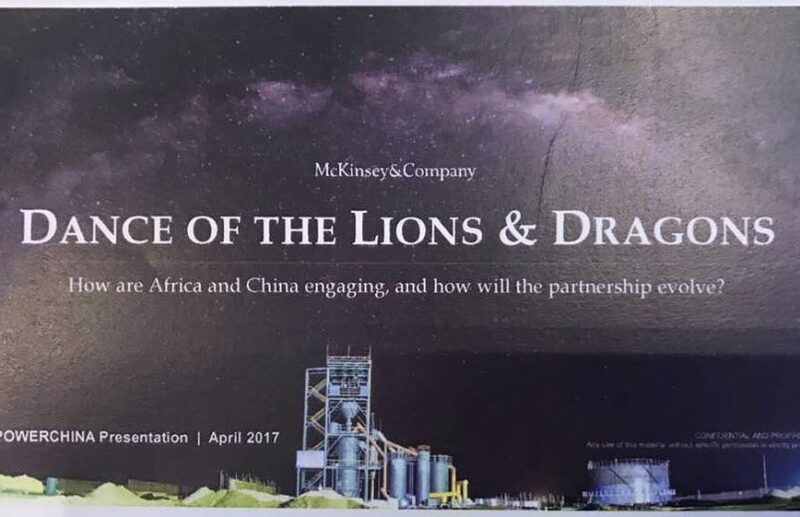 1) THE DRAGON HAS LANDED: AFRICA’S BIGGEST ECONOMIC PARTNER Since the turn of the 21st century, China has catapulted from being a relatively small investor in the continent to becoming Africa’s largest economic partner. And since the turn of the millennium, Africa-China trade has been growing at approximately 20 percent per year. Foreign direct investment (FDI) has grown even faster over the past decade, with a breakneck annual growth rate of 40 percent.1 Yet even this number understates the true picture: we found that China’s financial flows to Africa are around 15 percent larger than official figures suggest when nontraditional flows are included. China is also a large and fastgrowing source of aid and the largest source of construction financing; these contributions have supported many of Africa’s most ambitious infrastructure developments in recent years. We evaluated Africa’s economic partnerships with the rest of the world across five dimensions: trade, investment stock, investment growth, infrastructure financing, and aid. China is in the top four partners for Africa in all these dimensions. No other country matches this depth and breadth of engagement. 2) TEN THOUSAND BUSINESS BUILDERS: CHINESE FIRMS’ DIVERSITY, SCALE, AND AMBITION Behind these macro numbers are thousands of previously uncounted Chinese firms operating across Africa. In the eight African countries we focused on, the number of Chinese-owned firms we identified was between double and nine times the number registered by China’s Ministry of Commerce (MOFCOM), until now the largest database of Chinese firms in Africa. Extrapolated across the continent, these findings suggest there are more than 10,000 Chinese-owned firms operating in Africa today. Around 90 percent of these firms are privately owned—calling into question the notion of a monolithic, state-coordinated investment drive by “China, Inc.” Although state-owned enterprises (SOEs) tend to be bigger, particularly in specific sectors such as energy and infrastructure, the sheer multitude of private Chinese firms working toward their own profit motives make Chinese investment in Africa a more market-driven phenomenon than is commonly understood. Chinese firms operate across many sectors of the African economy. Nearly a third are involved in manufacturing, a quarter in services, and around a fifth in trade and in construction and real estate. In manufacturing, we estimate that 12 percent of Africa’s industrial production—valued at some $500 billion a year in total—is already handled by Chinese firms. In infrastructure, Chinese firms’ dominance is even more pronounced, and they claim nearly 50 percent of Africa’s internationally contracted construction market. The firms we talked to are profitable; nearly one-third of them reported 2015 profit margins of more than 20 percent. They are also agile and quick to adapt to new opportunities. Except in a few countries such as Ethiopia, they are primarily focused on serving the needs of Africa’s fast-growing markets rather than on exports. What of the years ahead? An overwhelming 74 percent of Chinese firms said they feel optimistic about the future. Reflecting this, most Chinese firms have made investments that represent a long-term commitment to Africa rather than shallower trading or contracting activities. • At the more than 1,000 companies we talked to, 89 percent of employees were African, adding up to more than 300,000 jobs for African workers. 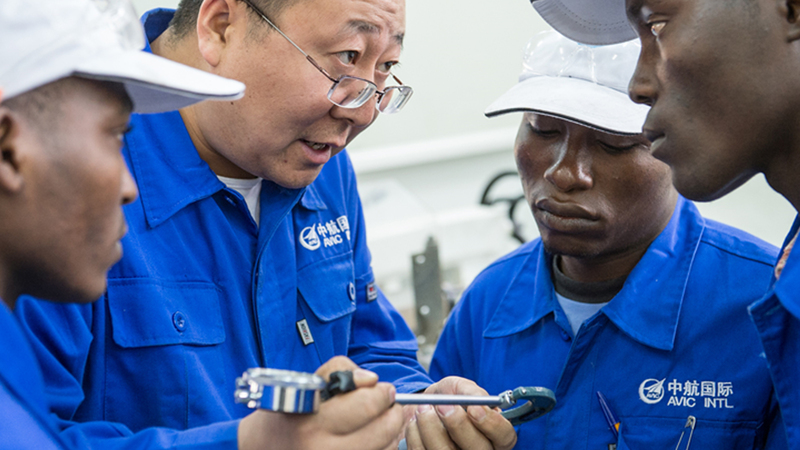 Scaled up across all 10,000 Chinese firms in Africa, these numbers suggest that Chinese-owned business already employ several million Africans. • Nearly two-thirds of Chinese employers provide some kind of skills training. In companies engaged in construction and manufacturing where skilled labor is a necessity, half offer apprenticeship training. • Half of Chinese firms have introduced a new product or service to the local market, and one-third have introduced a new technology. In some cases, Chinese firms have lowered prices for existing products and services by as much as 40 percent through improved technology and efficiencies of scale. • Chinese construction contractors command around 50 percent of Africa’s international engineering, procurement, and construction (EPC) market. African government officials overseeing infrastructure development for their countries cited Chinese firms’ efficient cost structures and speedy delivery as major value-adds. • By value, only 47 percent of the Chinese firms’ sourcing was from local African firms, representing a lost opportunity for local firms to benefit from Chinese investment. • Only 44 percent of local managers at the Chinese-owned companies we surveyed were African, though some Chinese firms have driven their local managerial employment above 80 percent. Other firms could follow suit. • There have been instances of major labor and environmental violations by Chinese owned businesses. These range from in inhumane working conditions to illegal extraction of natural resources including timber and fish. Robust partners. Ethiopia and South Africa have a clear strategic posture toward China, along with a high degree of economic engagement in the form of investment, trade, loans, and aid. For example, both countries have translated their national economic development strategies into specific initiatives related to China, and they have also developed important relationships with Chinese provinces in addition to with Beijing. As a result, China sees these African countries as true partners: reliably engaged and strategic for China’s economic and political interests. These countries have also created a strong platform for continued Chinese engagement through prominent participation in such forums as the Belt and Road initiative (previously known as One Belt, One Road), and they can therefore expect to see ongoing rapid growth in Chinese investment. Solid partners. Kenya, Nigeria, and Tanzania do not yet have the same level of engagement with China as Ethiopia and South Africa, but government relations and Chinese business and investment activity are meaningful and growing. These three governments recognize China’s importance, but they have yet to translate this recognition into an explicit China strategy. Each has several hundred Chinese firms across a diverse set of sectors, but this presence has largely been the result of a passive posture relying on large markets or historical ties; much more is possible with true strategic engagement. Unbalanced partners. In the case of Angola and Zambia, the engagement with China has been quite narrowly focused. In Angola’s case, the government has supplied oil to China in exchange for Chinese financing and construction of major infrastructure projects—but market-driven private investment by Chinese firms has been limited compared with other African countries; only 70 to 75 percent of the Chinese companies in Angola are private, compared with around 90 percent in other countries. Zambia’s case is the opposite: there has been major private-sector investment but not enough oversight from regulatory authorities to avoid labor and corruption scandals. Nascent partners. Côte d’Ivoire is at the very beginning of developing a partnership with China, and so the partnership model has yet to become clear. The country’s relatively small number of Chinese investors are focused on low-commitment sectors such as trade. One thing is clear to those who are closest to the Africa-China relationship: it will grow. We interviewed more than 100 senior African business and government leaders, and nearly all of them said the Africa-China opportunity is larger than that presented by any other foreign partner—including Brazil, the European Union, India, the United Kingdom, and the United States. But exactly how quickly will the Africa-China relationship grow in the decade ahead? We see two potential scenarios. In the first, the revenues of Chinese firms in Africa grow at a healthy clip to reach around $250 billion in 2025, from $180 billion today. This scenario would simply entail “business as usual,” with Chinese firms growing in line with the market, holding their current market shares steady as African economies expand. Under this scenario, the same three industries that dominate Chinese business in Africa today— manufacturing, resources, and infrastructure—would dominate in 2025 as well. We believe much more is possible: in a second scenario, Chinese firms in Africa could dramatically accelerate their growth. By expanding aggressively in both existing and new sectors, these firms could reach revenues of $440 billion in 2025. In this accelerated growth scenario, not only do the three established industries of Chinese investment grow faster than the economy, but Chinese firms also make significant forays into five new sectors: agriculture, banking and insurance, housing, information communications technology (ICT) and telecommunications, and transport and logistics. This expansion could start with Chinese firms moving into sectors related to the ones they currently dominate—for example, from construction into real estate and housing. Another part of this accelerated growth could come from Chinese firms more fully adapting their formulas that have proved successful in China to markets in Africa, including business models in consumer technology, agriculture, and digital finance. There is considerable upside for Africa if Chinese investment and business activity accelerate. At the macroeconomic level, African economies could gain greater capital investment to boost productivity, competitiveness, and technological readiness, and tens of millions more African workers could gain stable employment. At the microeconomic level, however, there will be winners and losers. Particularly in sectors such as manufacturing, where African firms lag behind global productivity levels, African incumbents will need to dramatically improve their productivity and efficiency to compete—or partner effectively— with the new dragons on their turf. For the foreseeable future, the dragons are here to stay. And with continued and likely growing Chinese involvement, it will become ever more urgent to address the gaps in the partnership, including a greater role for African managers and partners in the growth of Chinese-owned businesses. Moreover, both Chinese and African actors will need to address three major pain points: corruption in some countries, concerns about personal safety, and language and cultural barriers. In five of the eight countries in which we conducted fieldwork, 60 to 87 percent of Chinese firms said they paid a “tip” or bribe to obtain a license. After corruption, the second-largest concern among Chinese firms is personal safety. For their part, our African interviewees described language and cultural barriers that lead to misunderstanding and ignorance of local regulations. If these problems are left unaddressed, the misunderstandings and potentially serious long-term social issues could weaken the overall sustainability of the Africa-China relationship. Everyone—African or Chinese, government or private sector—has a role to play in realizing the promise of the Africa-China partnership. We suggest ten recommendations, consisting of actions to be taken by African and Chinese businesses and governments, to ensure the Africa-China relationship grows sustainably and delivers strong economic and social outcomes (see Exhibit E1). Previous Draft Kenya Investment Policy: Investment growth for sustainable development Next Investment policy reforms in Africa: How can they be synchronized?